The popularly termed Black Money Bill came to Rajya Sabha for discussion on May 13. I could only watch with great irritation and some amusement the magnanimity of the Presiding Chairperson of allowing all supporters of the Bill to consume almost the entire two hours allotted for discussion and disposal of the Bill. I must say I was a little surprised that the Congress Party also supported the Bill. Was it brilliant 'floor management', or depth of strategic partnership? My conscientious objection to the whole debate was that the entire time was consumed by only proclaimed supporters of the Bill. As the only opponent of the Bill, I was unfortunately given only four minutes to explain the fraudulent and anti-national conception and text of this hideous piece of legislation. I protested vigorously against this and informed the House and Chairperson that as sole opponent of the Bill, I needed better treatment. In all fairness, even members of the opposition including the Congress party pleaded that I should be heard. But all this made no impression on the Chair who stuck to his guns, much to the joy of the Hon'ble Minister of Finance. Even Congress Party members and other opposition speakers made the point that Bill has been wrongly called a Money Bill, something contrived only to prevent a vote in the Rajya Sabha. The contention was irrefutable, but with its overwhelming majority in the Lok Sabha the Speaker’s contrary opinion was obtained, and the Rajya Sabha Chairman pleaded he could not override it. I am of the view that if the objective of the Bill really was to find the criminals who had impoverished the nation, prosecute them, punish them, and deprive them of the fruits of crime, then the Speaker's decision to call it a Money Bill was totally wrong. It could not possibly be a Money Bill as defined in Article 110 of the Constitution of India. However, the Finance Minister who has been a practising lawyer for a few years, had decided that his Bill should be a real Money Bill which has nothing to do with identification of criminals, their prosecution and punishment and seizing their clandestine assets, the product of crime. The Bill is called The Undisclosed Foreign Income And Assets (Imposition Of Tax) Bill, 2015, a Bill to make provisions for undisclosed foreign income and assets, the procedure for dealing with such income and assets and to provide for imposition of tax on any undisclosed foreign income and assets held outside India and for matters connected therewith or incidental thereto. I must inform my readers that when the Modi government assumed office, I prepared the Bill which I believe is totally indispensable if the promise made repeatedly to the innocent voters of India has reasonable chance of fulfillment. I made it in consultation with the BJP Task Force and the distinguished expert Professor Vaidyanathan. "4 (a) The right, title and interest of every Indian National in such money such stand transferred to and vested absolutely in the Central Government of India. If this piece of legislation had been promulgated immediately after the BJP Government assumed office, our present impotence would have been avoided. Let me explain to readers the cause of my anxiety. The notorious Hassan Ali of Pune was found to be a holder of an account in a Swiss Bank with an amount of 8 Billion Dollars. His name was not obtained by us from any government or bank abroad. The evidence was found on search of Hassan Ali’s own premises. During his interrogation he admitted that the Swiss bank account was his, but pleaded that the money was put by others without his knowledge, meaning thereby that he was laundering money for others. An honest police officer had interrogated him and had probably discovered the names of the money launderers. To prevent a false denial of this confession the officer set up a camera to record his interrogation. But before the interrogation could be completed, the officer was removed and disgraced, and hardly any action was taken against Hassan Ali or his money launderers. Hassan Ali was granted bail, but fortunately, the Supreme Court intervened and cancelled it. The Finance Minister’s Bill will be a bonanza to let off Hassan Ali and his likes with a mere fiscal penalty and tax. At a later stage of the case a statement was made by the Government Counsel before Supreme Court that out of the amount of 8 billion USD, only a paltry sum of 40,000 dollars remains in Hasan Ali’s account. The Finance Minister’s bonanza would enable even this to disappear. Every informed person in India today believes that by now all the black money abroad has been shifted to new destinations. But the comforting fact is that all such movements leave behind electronic or paper footprints. Only criminalization of such acts, and punitive measures can bring back our money from wherever it is now hidden. May I ask why the Bill for repatriation of Black Money which I had sent to the Prime Minister in November last year for nationalizing all illegal money abroad was disregarded? Conclusive evidence that the present Bill is a fraud is provided by the fact that the Congress party has supported it. Do we need any further proof. This Article is first published here. 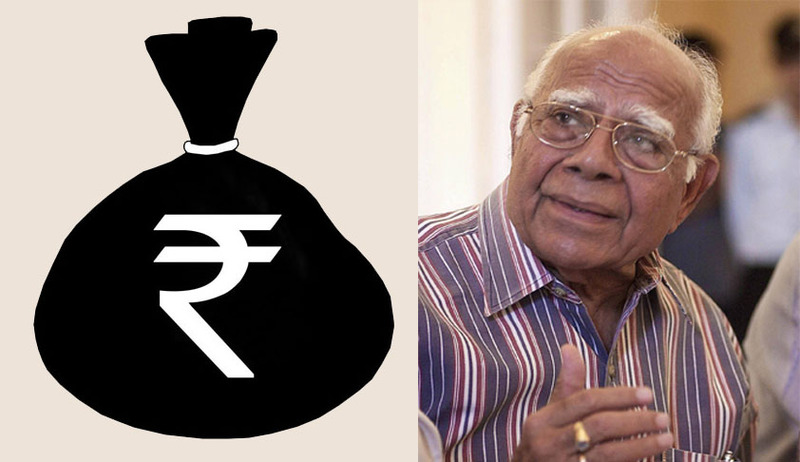 The blog has been created to provide a one-stop-destination for all the readers and followers of Mr. Ram Jethmalani, to read all his Article. We re-publish this as a tribute to the Legendary Lawyer.